The 20 year anniversary is marked by the establishment in 1993 of Lockheed-Khrunichev-Energia International (LKEI), the joint venture created to exclusively market the Russian Proton launch vehicle to the commercial launch industry. LKEI was later reestablished as International Launch Services in 1995. The ILS/Khrunichev venture represents one of the most successful post-Cold War economic cooperation between the United States and Russia. The partnership results in the “best of both worlds” combining the legacy of one of the world’s largest space production centers with the talent and experience of the ILS team. •Thousands of jobs created. Khrunichev has created roughly 100,000 jobs in Russia. 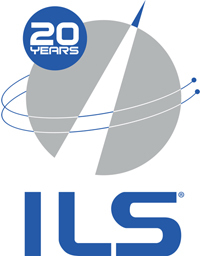 ILS employs approximately 60 professional U.S. citizens, as well as 41 U.S. based sub-contractors. •A robust, growing industry leader. The value of all commercial contracts signed to date by the partnership equals $7.5 billion. This represents 50 percent of Khrunichev’s business over the past decade. •Satellite launch leader. The partnership accounts for launching 30% of the global commercial space market, a stronger market share than any other Russian launcher. •An important economic contributor to the U.S. economy. ILS’ direct contribution to the U.S. economy is approximately $35-40 million per year. •A key asset in the aerospace market. 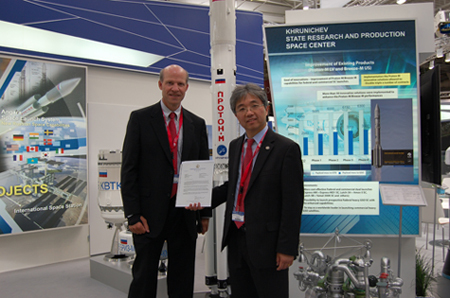 In addition to serving the global space market with launches for numerous companies and governments, Khrunichev is a premier player in research and development of space technology solutions. Paris Air Show, June 18, 2013-Virginia Secretary of Commerce, Jim Cheng and Bob Sledd, Senior Economic Advisor to the Virginia Governor, present a letter of support and congratulations on the ILS and Khrunichev 20th anniversary of the commercialization of the Proton vehicle.